Hsi Lai Temple (Simplified Chinese: 西来寺; Traditional Chinese: 西來寺; Pinyin: Xīlái Sì) is a traditional Chinese Buddhist mountain monastery. It is located on the foothill region of Hacienda Heights, California, USA, a suburb of Los Angeles. The name «Hsi Lai» means Coming to the West, by which they mean the Buddha Dharma. The temple is one of the first branch temples of Taiwan’s largest charity and religious organization, Fo Guang Shan, founded by Venerable Master Hsing Yun. This temple is also the site of the founding of Buddha’s Light International Association, which was established in 1991. The temple, like its main temple in Taiwan, follows the Rinzai Zen school of Buddhism, and also follows the Pure Land School. The temple was also the site of the 16th General Conference of the World Fellowship of Buddhists. In 1976, Master Hsing Yun represented a Buddhist group from Taiwan to participate in America’s bicentennial celebration. Many American friends asked Master Hsing Yun to build a monastery in the US. 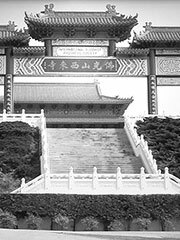 Therefore, Fo Guang Shan asked the Venerables Tzu Chuang (the first abbess of Hsi Lai Temple) and Yi Hung to plan and organize the construction of the temple in the Greater Los Angeles area. It was officially registered under the name of International Buddhist Progress Society. Until the temple was complete, Ven. Tzu Chuang bought an old church building, which was to be Hsi Lai’s temporary headquarters. The original temple was called Bai Ta (White Pagoda) Temple. The building of the temple survived six public hearings and 165 explanatory sessions. The planning and construction of the temple, in the 1980s, were met with suspicion and resistance from local residents outside of the Asian/Buddhist community, many of whom knew little about Buddhism or had negative attitudes. In 1985, the temple was finally granted a building permit. The groundbreaking ceremony was held the following year, and was completed on November 26th, 1988. The temple was finished at a cost of $10 million. Such negative feelings about the building of Hsi Lai have diminished as the general level of awareness has been raised and as the temple and its residents have proven to be good neighbors. In addition, when the temple opened, the Master blessed the land from the highest point on the property, and some believe that the blessing brings good fortune and will raise property values. The current abbot (as of 2005) is Venerable Hui Chi. In 1990, in conjuction to the completion of Hsi Lai Temple, Master Hsing Yun founded Hsi Lai University, one of sixteen Buddhist colleges and universities operated by Fo Guang Shan. The university was relocated in Rosemead, California in 1996. It is one of the first Buddhist colleges in the United States. There are departments for Bachelor of Arts and Master of Arts in Buddhist studies, comparative religious studies, and a Master of Business Administration program is also offered. In 2004, the university changed its name to the University of the West and appointed Lewis Lancaster, a religious professor at UC Berkeley and longtime member of Fo Guang Shan, as president. The Bodhisattva Hall: The first shrine before entering the temple. It is a large hall that honors five Bodhisattvas, Samantabhadra (Pǔxián), Ksitigarbha (Dìzàng), Maitreya (Mílè), Avalokitesvara (Guan Yin), and Manjushri (Wenshu). Outside the shrine, on each side, honors the Bodhisattvas Skanda (Weituo) and Sangharama (Qielan). The Arhat Garden: Located on the left of the temple, it contains 18 statues of the earliest known disciples of the Buddha. The Avalokitesvara Garden: Located on the right of the temple, it is also known as the «Salvation Garden». It contains the acolytes of Avalokitesvara (Guan Yin) and statues of the Four Heavenly Kings. Founder’s Statue: A statue of Venerable Master Hsing Yun. It is an bronze effigy of the master in a very lifelike pose, stepping forward with a heroic stride. The statue is behind the Bodhisattva hall, facing the main shrine. Main Shrine: The heart of the temple’s activities. It contains the statues of the historical Sakyamuni Buddha (Shijiamounifo), Amitabha Buddha (Omituofo), and Bhaisajyaguru Buddha (Yaoshifo). Thousands of niches containing an image of the Buddha can be seen on the walls. Outside, a large bell and drum can be seen on either side. Traditionally in many Chinese Ch’an temples, they are played daily to ready monastics for daily practice. Hsi Lai does not use these instruments regularly because of their loud volume when played, and there are residential areas at the foot of the temple. The bell and drum are only used to mark special occurrences. Requiem Pagoda: Located at the summit of Hsi Lai, it honors those who have passed away. In the past, it was also a mausoleum, but since there was no more room for urns to be interred, the urns were moved to a new Buddhist mausoleum built by Hsi Lai Temple in 1999, located at Rose Hills Memorial Park in Whittier. The Requiem Pagoda is now for people who entered their loved one’s names in the pagoda, and can only be accessed by request. Meditation Hall: Located on the back of the main shrine, and next to the monastic dorm rooms, meditation classes are held here. Dining Hall: Vegetarian buffets are served here every day for breakfast, lunch and dinner. In the past, people were charged to pay for these foods, but due to complaints that the temple was seen as «money-grubbing,» the temple has stopped charging people since, and a voluntary donation can be made instead. Translation and Publishing Center: The Fo Guang Shan International Translation Center and Buddha’s Light Publishing are located on the very top of the temple complex cross facing to the Requiem Pagoda. BLP was established to publish Buddhist books translated by F.G.S.I.T.C. as well as other valuable Buddhist works. BLP is committed to building bridges between East and West, Buddhist communities, and cultures. Because of the temple’s beautiful surroundings and various facilities, Hsi Lai is a popular venue for tourists interested in knowing more about Chinese culture and Buddhism. Over the years since its foundation, Hsi Lai has been a favorable site for school field trips, business trips, organization meets, and a center for interreligious dialogue. The temple facilities have been utilized for over ten thousand occasions and group activities with favorable feedback. Not only does Hsi Lai have workshops on Buddhism, the temple also holds workshops on a wide range of topics including taxation, legal issues, education, immigration, marriage, family discipline, etc. Invitied speakers are experts in their respective fields who are willing to share their knowledge for the benefit of others. Regular Dharma functions are held weekly on Sunday morning, where they usually chant various sutras, such as the Diamond Sutra or the Amitabha Sutra, and meditation and Buddhism classes in both English and Chinese, are held on some days of the week. Monks who can speak a variety of languages besides Mandarin, primarily English and Cantonese, are available to perform weddings or funerals. Many services Hsi Lai Temple holds annually all revolve around filial piety, the Buddhist and Taoist philosophy of love and respect for one’s parents and ancestors. In the spring, they hold a large service in commemoration of Ching Ming, a traditonal Chinese festival where many pay respects to deceased relatives by cleaning their graves. In the summer, they hold a large service in commemoration of Ullambana. During this time, they also hold a ceremony known as Sangha Day, where devotees gather to honor the monastics by offering food to them, as well as offer a public cultural performance, performing classical and traditional Chinese music or elegant solo dances. Annually, they also have retreats for those who wish to take refuge in the Triple Gem, retreats for those who wish to receive the five precepts, and even a short-term monastic retreat. Water Repentance Service (水懺法會): A one day repentance service for filial piety. Held during Ching Ming. Emperor Liang Repentance Service (梁皇法會): A week long repentance service held during Ullambana. Amitabha 7-day Retreat (彌陀佛七): Seven days of reciting the Amitabha Sutra, in respect of Amitabha’s birthday. Yogacara Flaming Mouth (瑜伽焰口): A Tantric ceremony inviting sentient spirits. Held in the afternoon after Sangha Day, and at the end of the Emperor Liang Repentance service. Great Compassion Repentance Service (大悲懺法會): Monthly service held in the evening on the second friday. A popular service at Hsi Lai, it involves the recitation of the Great Compassion Mantra, elaborate bowing, offering, and circumbulations. Grand Offering to Celestial Beings (供佛齋天): A ceremony inviting bodhisattva general Wei Tuo and his thirty-two heavenly generals. Held on Chinese New Year’s eve and Chinese New Year day. Bathing the Buddha Ceremony (浴佛法會): Held during Wesak, it involves bathing a statue of the baby Buddha, recreating his birth in Lumbini. Thousand Buddha Repentance Service (千佛法會): A three day service of bowing to a total of 3,000 Buddhas; held during Chinese New Year celebrations. Waterland Dharma Function (萬緣水陸大法會): The largest Buddhist ritual in Chinese Buddhism. Hsi Lai last held this service in 1985 for the grand opening and in 2000 to celebrate the millennium. This service involves the invitations of beings of the higher realms to help the beings in the lower realms get out of their sufferings. During the 1996 presidential campaign, Vice President Al Gore held a fundraiser at Hsi Lai Temple. The temple fundraising luncheon attended by Gore was implicated in a campaign donation laundering scheme. In that scheme, donations nominally from Master Hsing Yun and two Buddhist nuns, Venerables Man Ho and Yi Chi, in lawful amounts had actually been donated by wealthy monastics and devotees. Critics noted that the nuns, who each supposedly gave $1000 to the Clinton-Gore campaign, had actually taken monastic vows of poverty. Gore attempted to dodge the criticism by claiming ignorance, saying he «drank a lot of iced tea» at the function and, as a result, had made several trips to the bathroom. It was during these bathroom breaks, he claimed, that he missed the illegal activity. This was widely perceived as disingenuous and, by critics, as an outright lie designed to avoid the consequences of illegal fundraising. In this context, Hsi Lai was often referred to in the media as simply «the Buddhist temple». Venerables Man Ho and Yi Chi are currently still living at the temple, but remain elusive. Since 1988, members of Hsi Lai and others have said that the temple is the largest temple in the western hemisphere. However, another temple, known as the City of Ten Thousand Buddhas situated in Talmage (a city in Northern California), has begun claiming they are larger. Since the city monastery has not gained a large worldwide presence like Hsi Lai has, this claim has been disputed.